Matthew Zapruder has a surprising answer for those intimidated by poetry: it's easier than you think, he claims in this conversational and wide-ranging essay, to love poetry. Culling examples from Virginia Woolf to Anne Carson to Shakespeare, Zapruder (a poet himself) offers a refreshing antidote to the stuffiness of academic study, and breathes new life into poetry. 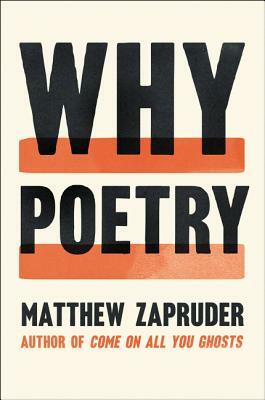 In Why Poetry, award-winning poet Matthew Zapruder argues that the way we have been taught to read poetry is the very thing that prevents us from enjoying it. He takes on what it is that poetry—and poetry alone—can do. In lively, lilting prose, he shows us how that misunderstanding interferes with our direct experience of poetry and creates the sense of confusion or inadequacy that many of us feel when faced with a poem.